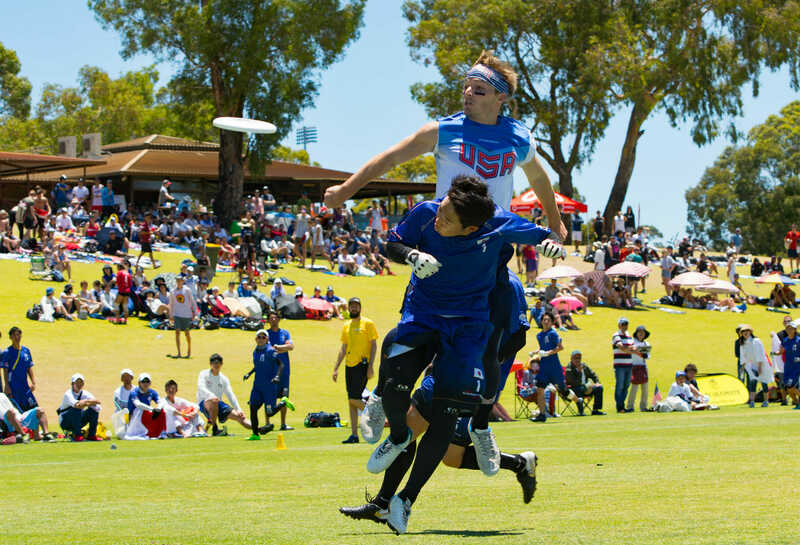 Our coverage of the Under-24 World Championships is presented by VC Ultimate. All opinions are those of the authors. Thanks for supporting the brands that make Ultiworld possible! In a thrilling final and their first and last challenge of the tournament, the United States Mixed National Team won the gold medal game at the Under-24 World Championships over Japan, 13-11. It was the team’s third straight gold medal in the Mixed division. The score was also the closest of any of the team’s games, during a tournament in which the Americans rarely trailed1. The United States, after a dominating showing in 2015 and throughout the majority of this year’s event, was handicapped as a heavy favorite in the match. But like the US, Japan entered the game undefeated, though, in contrast to the US, the Japanese team had some close calls along the way. They earned hard fought victories over the tournament’s other top seeds, Canada (14-13) and Australia, both in pool play (13-11) and in their semifinal (14-10). It was an auspicious beginning for Japan, as the US failed to convert on their first two O-line possessions, including a scoring throw from Dylan Best to Joe Freund, who couldn’t complete the catch while trying to toe the line. The Japanese team worked the field, running a vertical stack that leaned towards the sideline that the disc approached, leaving lots of space to sit throws out. Freund backpacked an upline cutter, but Japan remained unflustered, stuffing a forehand upwind to Chihiro Mino for an upwind break. There was a decent wind, much as there had been all week, although it wasn’t quite as upwind-downwind as earlier games had been. The sun was blistering, however, wearing on players and testing their resolve. The US earned the break back on their first D-line point, capitalizing on a missed deep connection from Japan with a confident possession that marched the other way. JD Hastings found Kirstin Johnson for the first of her two goals in the game. It was the first showing of how stingy the United States could be, but it would not be the last patient possession they would utilize. A few points later, down 3-2, Japan pulled out a compact zone that often put four defenders around the disc. The American offense felt comfortable enough to throw a lot of passes, but they dropped the tiny throw that would have made for a 58th completion on their opening possession. However, Japan botched a swing soon thereafter, and the US was able to punch through the Japanese defense. On the following point, the United States reclaimed the lead in a grinding and extended point. It concluded when Anna Thompson cannoned a backhand from her own goal line to Alissa Soo, and the US tapped in the downwind break to go up 4-3. This break began a run for the reigning champions, continued by a Kristen Pojunis run-through block that set up a short field break and a clean advancement following a Japanese overthrow, pushing their advantage to 6-3. It looked like they might run away with it like they had in all of their other games. The Japanese, however, were not done. They held after both teams missed on some hucks, but a foul from JD Hastings gave the underdogs a shot to get back into it, functioning as a deep completion. They didn’t waste it, converting on a Mino throw to Yuka Sakai. With the score 6-4, the US almost held on the next point, but Tannor Johnson got impatient in the red zone, and Akifumi Muraoka sprung into action for a beautiful layout poach block. That type of block was one they excelled at, generating a few turns by getting a step ahead of the US’s structured cuts and breaking up the play before the thrower realized they were in the crosshairs. 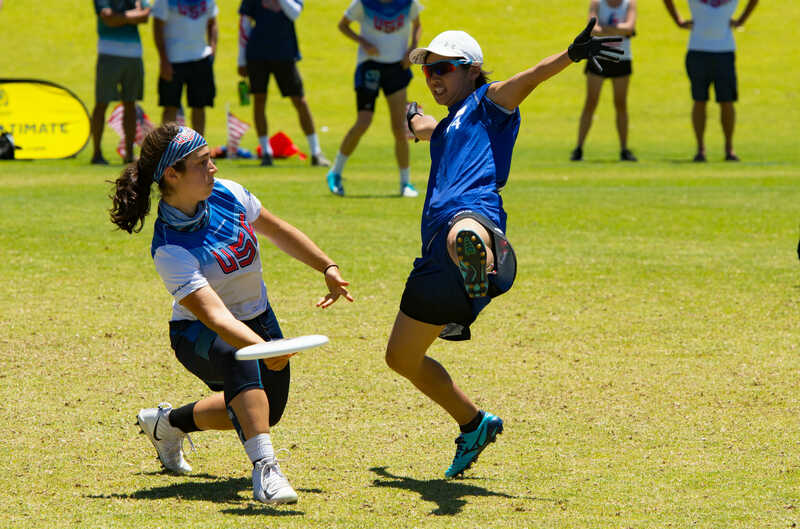 While the US got the disc back, Lior Givol tossed a swing out of bounds of the US’s own endzone, and Japan gladly accepted the gift for a break to bring the score to 6-5. Japan proved to be incredibly efficient in some of the game’s key metrics in the first half. They completed six of their 11 deep looks2 and five of their seven red zone possessions into goals. Those are much more attractive numbers than the Americans’ four for nine on hucks and five for nine on red zone possessions. This ability to convert in critical situations helped keep them in the game. The US managed to navigate both Japan’s mixed zone looks and matchup – often backhand force – for the rest of the second half but couldn’t contain Ryotara Murokami in the deep space. He squeezed free to receive a couple of long throws, including a huge sky over a pack on an upwind floater in the final point of the first half. However, Japan failed to convert that possession. A pair of poor foul calls from Anna Thompson retained possession in lieu of two throwaways. On the United States’s third possession of the point, Henry Phan skied a defender to reel in a Thompson backhand huck and Claire Revere notched the goal to end the first half up 8-7. The second half started with a John Stubbs layout block that set up a simple sequence for a US break. But Japan responded quickly thereafter, again hurting the Americans after a near-miss. Brett Gramann couldn’t connect with a bidding Alison Griffith near the endzone. Takuya Seki sent a long backhand the other way and Murokami made a huge grab over Gramann to set up the Japanese break that tied the game at 9-9. The two teams continued to exchange blows: a high-flying poach block by Kanta Takahashi saved a goal for Japan and an Eli Motycka handblock got it right back. The Americans carried an 11-10 lead as they pulled to Japan in a game to 13. The point was long and hard fought and featured nine changes of possession. Many were blocks, punctuated by a massive interception by Matt Gouchoe-Hanas just outside Japan’s endzone and a critical aerial block by Gramann on a Japanese huck. But it was the US who took it, with an inside break from Pojunis to Kirstin Johnson, to reestablish the two goal lead. Even then, Japan responded to the pressure, scoring after a skillful forehand up the inside lane of the vertical stack from Amisa Sasaki got them within striking distance to score upwind. But the US put the game away, capitalizing on a short field throwaway to convert in the red zone for the gold medal, 13-11. It feels like the Americans were almost lucky to survive. They certainly weren’t more efficient in the brief second half, turning the disc in the red zone four times in seven tries, a far cry from Japan’s 75% conversion rate. The Americans also didn’t complete a huck, although Japan’s effectiveness dropped to 50% on four attempts, as well. But what the US had in the second half was tenacious defense, and when they summoned it, an offense willing to throw as many passes as it took. They advanced through the field far more effectively than Japan and gave up fewer short fields. There were multiple 50+ throw possessions through Japan’s zones. The game was a marvelous showcase of the stark contrasts in the strengths of the two teams. Japan’s numerous poach blocks swung points on a dime, and their ability to manipulate short throws and turn them into power positions was hard for Americans to really defend. It’s how players like Sakai and Muraoka could remain aggressive looking deep. It helped to have Murakami’s athleticism and timing on the other end, winning battles in the air against such a tall opposition. For the United States, with such lengthy possessions as highlights, the game was very handler-driven. Matt Gouchoe-Hanas and Anna Thompson, ostensibly the center handlers for the team’s two primary lines, did not have a single turnover, despite 54 and 33 touches, respectively3. “We were really focusing on being able to switch the field well, so that we could open and attack space both under and away, because we knew that the matchups would be tight and we needed the throwing windows to be able to be successful,” said Boyle. Kirstin Johnson also played a blinder, as they say, with two goals, an assist, and zero turnovers, frequently showing up in the right place at the right time. John Stubbs was incredibly reliable as well, and while Gramann had some costly mistakes, he also made some fantastic plays, and his motor was always running. He turned in three assists to lead the team alongside two blocks, mitigating some of his five turnovers. Claire Revere led the team in goals, scoring on four of her 17 catches and showing great timing and poise. It was, at least to American pundits, a wonderful surprise to close out the weekend with such a thrilling contest that gave the United States a chance to really test their mettle. 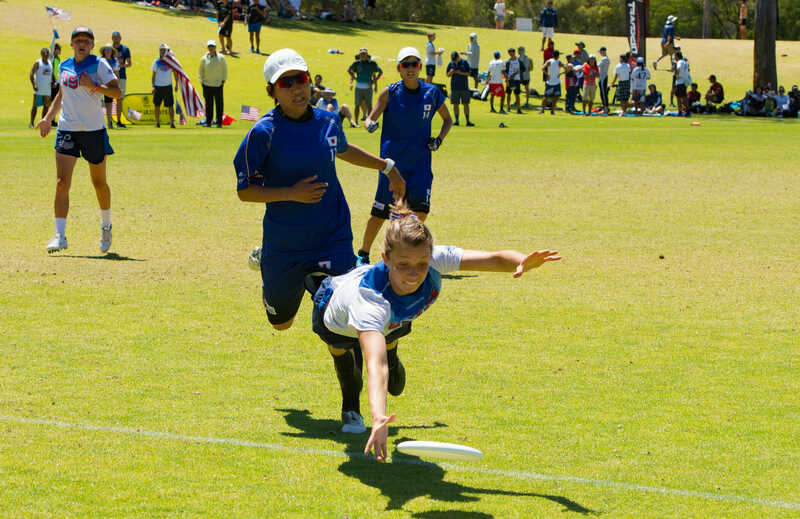 Perhaps even more fun, it exposed a US audience to the unique and effective style of play in Japanese mixed ultimate. And it will only make the run-up to future international mixed events feel even more exciting for everyone. Canada handily defeated Australia 15-8 in the third place game to win the final spot on the podium. Quinn Snyder had a big game with three goals and a pair of assists as Canada used three, four, and six point runs to blow by Australia for the second time at the tournament. Additional reporting from Kingsley Flett. Comments on "U24 Worlds: USA Mixed Edges Out Japan For Gold, Canada Takes Bronze"